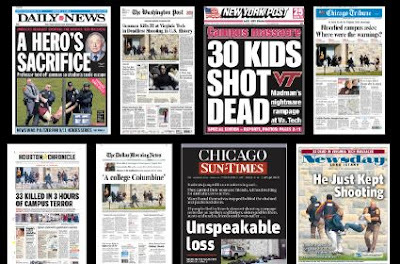 Newsdesigner has a roundup of front pages featuring news of the Virginia Tech shootings. There are imags from the top 50 U.S. newspapers, some international newspapers, and Virginia Tech’s student paper, the Collegiate Times. As several visitors point out in Newsdesigner’s comments, these front pages tend to highlight news a day late. Of course, this is traditionally what newspapers have done — let you read the day’s news the next morning. But in the face of such a horrific event, it seems inadequate. There are probably few Americans who were not aware of the Virginia Tech incident when they opened the paper Tuesday morning. Whether they found out about it from the radio, television, internet, or a friend, they already knew. Of course, the papers can probe a story much more deeply than most broadcast news reports, and people often turn to the morning paper for more insight than they were able to get immediately following the event. And I’m not saying the newspaper stories didn’t offer that insight. What I’m saying is that the headlines told us what we already knew, and not what would come next. While most of the papers showed images of police and gurneys, the Collegiate Times showed a group of students holding hands and features stories of a community coping with tragedy. The Collegiate Times website has been hammered by traffic, and it’s currently being hosted at Collegemedia.com.